The Congregation of the Sacred Hearts of Jesus and Mary and of the Perpetual Adoration of the Most Holy Sacrament of the Altar is a Roman Catholic religious institute of brothers, priests, and nuns. The priests of the Congregation of the Sacred Hearts of Jesus and Mary are also known as the Picpus Fathers, because their first house was on the Rue de Picpus in Paris, France. 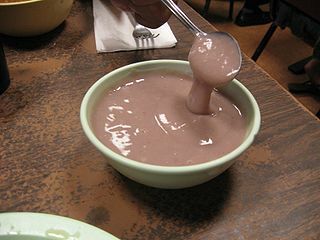 Their post-nominal letters, SS.CC., are the Latin initials for Sacrorum Cordium, "of the Sacred Hearts"..
Poi is primarily the traditional staple food in native cuisine of Hawaii, made from the underground plant stem or corm of the taro plant. A leper colony, leprosarium, or lazar house was historically a place to quarantine people with leprosy. The term lazaretto can refer to quarantine sites, which were at some time also "colonies", or places where people affected by leprosy lived or were sent. Father Damien has been described as a "martyr of charity". He was the tenth person in what is now the United States to be recognized as a saint by the Catholic Church. In both the Latin Rite and the Eastern Rites of the Catholic Church, Father Damien is venerated as a saint. In the Anglican communion, as well as other denominations of Christianity, Damien is considered the spiritual patron for leprosy and outcasts. Father Damien Day, April 15, the day of his passing, is also a minor statewide holiday in Hawaii and to this day Father Damien is the patron saint of the Diocese of Honolulu and of Hawaii. In the Catholic Church, a martyr of charity is someone who dies as a result of a charitable act or of administering Christian charity. 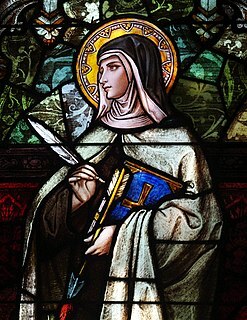 While a martyr of the faith, which is what is usually meant by the word "martyr", dies through being persecuted for being a Catholic or for being a Christian, a martyr of charity dies through practicing charity motivated by Christianity. This is an unofficial form of martyrdom; when the Pope Paul VI beatified Maximilian Kolbe he gave him that honorary title. Earlier martyrs of charity who were canonized were recognized as "Confessor of the Faith" rather than martyrs. The Flemish or Flemings are a Germanic ethnic group native to Flanders, in modern Belgium, who speak Flemish, but mostly use the Dutch written language. They are one of two principal ethnic groups in Belgium, the other being the French-speaking Walloons. Flemish people make up the majority of the Belgian population. Historically, all inhabitants of the medieval County of Flanders were referred to as "Flemings", irrespective of the language spoken. The contemporary region of Flanders comprises a part of this historical county, as well as parts of the medieval duchy of Brabant and the medieval county of Loon. This ethnic group, marginalized by Walloon Belgians historically through violent oppression, has used its newfound economic power to organize an independence movement. Tremelo is a municipality located in the Belgian province of Flemish Brabant, in Flanders. The municipality comprises the towns of Baal and Tremelo proper. On January 1, 2006, Tremelo had a total population of 13,725. The total area is 21.57 km² which gives a population density of 636 inhabitants per km². Following in the footsteps of his older sisters Eugénie and Pauline (who had become nuns) and older brother Auguste (Father Pamphile), Damien became a "Picpus" Brother (another name for members of the Congregation of the Sacred Hearts of Jesus and Mary) on 7 October 1860. His superiors thought that he was not a good candidate for the priesthood because he lacked education. However, he was not considered unintelligent. Because he learned Latin well from his brother, his superiors decided to allow him to become a priest. During his ecclesiastical studies, Damien prayed daily before a picture of St. Francis Xavier, patron of missionaries, to be sent on a mission. Three years later when Damien's brother Father Pamphile could not travel to Hawaiʻi as a missionary because of illness, Damien was allowed to take his place. 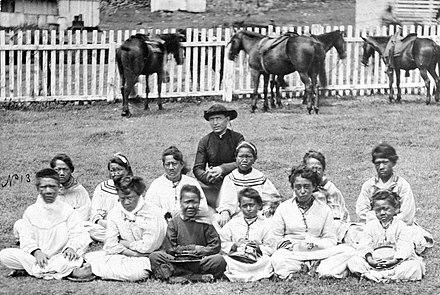 In 1865 Father Damien was assigned to the Catholic Mission in North Kohala on the island of Hawaiʻi. While Father Damien was serving in several parishes on Oʻahu, the Kingdom of Hawaiʻi was struggling with a labor shortage and a public health crisis, as identified by planters. 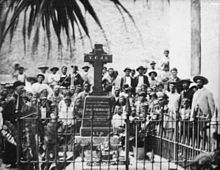 Many of the parishioners Native Hawaiians had high mortality rates to such Eurasian infectious diseases as smallpox, cholera, influenza, syphilis, and whooping cough, brought to the Hawaiian Islands by foreign traders, sailors and immigrants. Thousands of Hawaiians died of such diseases, to which they had no acquired immunity. The Royal Board of Health initially provided the quarantined people with food and other supplies, but it did not have the manpower and resources to offer proper health care. According to documents of that time, the Kingdom of Hawaiʻi did not intend for the settlements to be penal colonies, but the Kingdom did not provide enough resources to support them. The Kingdom of Hawaii had planned for the lepers to be able to care for themselves and grow their own crops, but, due to the effects of leprosy and the local environmental conditions of the peninsula, this was impractical. Damien worked with them to build a church and establish the Parish of Saint Philomena. In addition to serving as a priest, he dressed residents' ulcers, built a reservoir, built homes and furniture, made coffins, and dug graves. Six months after his arrival at Kalawao, he wrote to his brother, Pamphile, in Europe: "...I make myself a leper with the lepers to gain all to Jesus Christ." King David Kalākaua bestowed on Damien the honor of "Knight Commander of the Royal Order of Kalākaua". When Crown Princess Lydia Liliʻuokalani visited the settlement to present the medal, she was reported as having been too distraught and heartbroken at the sight of the residents to read her speech. The princess shared her experience, acclaiming Damien's efforts. Consequently, Damien became internationally known in the United States and Europe. American Protestants raised large sums of money for the missionary's work. The Church of England sent food, medicine, clothing, and supplies to the settlement. It is believed that Damien never wore the royal medal, although it was placed by his side at his funeral. Despite the illness slowing down his body, in his last years, Damien engaged in a flurry of activity. He tried to complete and advance as many projects as possible with his time remaining. While continuing to spread the Catholic Faith and aid the lepers in their treatments, Damien completed several building projects and improved orphanages. Four volunteers arrived at Kalaupapa to help the ailing missionary: a Belgian priest, Louis Lambert Conrardy; a soldier, Joseph Dutton (an American Civil War veteran who left behind a marriage broken by alcoholism); a male nurse, James Sinnett from Chicago; and Mother (now also Saint) Marianne Cope, who had been the head of the Franciscan-run St Joseph's Hospital in Syracuse, New York. Conrardy took up pastoral duties; Cope organized a working hospital; Dutton attended to the construction and maintenance of the community's buildings; and Sinnett nursed Damien in the last phases of illness. Father Damien had become internationally known before his death, seen as a symbolic Christian figure caring for the afflicted natives. His superiors thought Damien lacking in education and finesse, but knew him as "an earnest peasant hard at work in his own way for God." News of his death on 15 April was quickly carried across the globe by the modern communications of the time, by steamship to Honolulu and California, telegraph to the East Coast of the United States, and cable to England, reaching London on 11 May. Following an outpouring of praise for his work, other voices began to be heard in Hawaiʻi. Ken Howard had the title role in the television film Father Damien: The Leper Priest (1980);  he replaced David Janssen, who died suddenly after a couple of days of shooting. Screenwriter and film director John Farrow wrote the biography Damien the Leper (1937). In 1939, RKO Pictures purchased the book for a feature film titled Father Damien, to be directed by Farrow and star Joseph Calleia. The project was not realized. 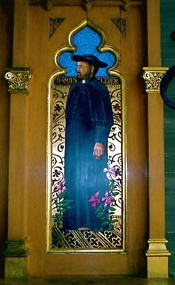 The Father Damien Statue on the steps of the State Capitol Building honors him, and a replica is displayed in the National Statuary Hall Collection in the United States Capitol. Statues in memory of Damien can be found in many Belgian cathedrals, such as the Tournai Cathedral, St Bavo's Cathedral, Ghent, and St Martin's Cathedral, Ypres. In 2005, Damien was honored with the title of De Grootste Belg , chosen as "The Greatest Belgian" throughout that country's history, in polling conducted by the Flemish public broadcasting service, VRT. He ranked third on Le plus grand Belge ("The Greatest Belgian") in a poll by the French-speaking public channel RTBF. Schools named after him include Damien High School in Southern California, Saint Damien Elementary School in Calgary, Canada, and Damien Memorial School in Hawaii. The village of Saint-Damien, Quebec is also named after him. Churches worldwide are named after him. Molokaʻi, nicknamed “The Friendly Isle”, is the fifth largest island of eight major islands that make up the Hawaiian Island Chain in the middle of the Pacific Ocean. It is 38 by 10 miles in size at its extreme length and width with a usable land area of 260 square miles (673.40 km2), making it the fifth-largest of the main Hawaiian Islands and the 27th largest island in the United States. It lies east of Oʻahu across the 25-mile (40 km) wide Kaiwi Channel and north of Lānaʻi, separated from it by the Kalohi Channel. The Cathedral Basilica of Our Lady of Peace — also known by its original French name Cathédrale de Notre Dame de la Paix, its Portuguese variant Catedral de Nossa Senhora da Paz and its Hawaiian derivative Malia o ka Malu Hale Pule Nui — is the mother church of the Diocese of Honolulu and houses the cathedra of the Bishop of Honolulu in Honolulu, Hawaiʻi. It is located at the north end of Fort Street Mall in downtown Honolulu. Another cathedra was installed in the Co-Cathedral of Saint Theresa of the Child Jesus, also serving the diocese. Gulstan Ropert, SS.CC., of the Congregation of the Sacred Hearts of Jesus and Mary served as the third vicar apostolic of the Apostolic Vicariate of the Hawaiian Islands — now the Roman Catholic Diocese of Honolulu, from 1892 to 1903. Born in France at Kerfago, St. Gildas de Rhuys, Morbihan, in Brittany, he was baptized as François. François Ropert entered the Congregation of the Sacred Hearts of Jesus and Mary at age 20 and took the name Gulstan. He was ordained to the priesthood on May 26, 1866, at the age of 26. He was sent to the Kingdom of Hawai‘i to assist the Vicariate, arriving in Honolulu on June 9, 1868. He was in charge of the Hamakua district on the island of Hawai‘i until October 2, 1883, when he was assigned to the Wailuku mission. He left Wailuku for Honolulu in 1891 having been appointed Vice-Provincial. 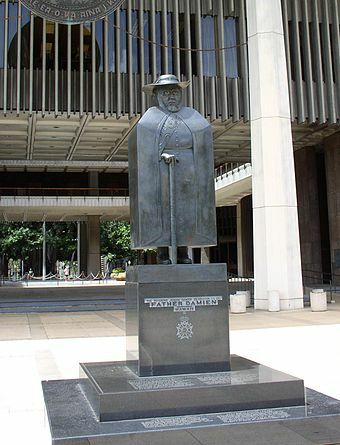 The Father Damien Statue, also called the Saint Damien of Molokaʻi Statue, is the centerpiece of the entrance to the Hawaiʻi State Capitol and the Hawaiʻi State Legislature in Honolulu, Hawaiʻi. A second bronze cast is displayed in the National Statuary Hall Collection in the United States Capitol, along with the Kamehameha Statue. The landmark memorializes the famous Hawaiʻi Catholic Church priest from Belgium who sacrificed his life for the lepers of the island of Molokaʻi. Father Damien is considered one of the preeminent heroes of Hawaiʻi, and was canonized by Pope Benedict XVI on October 11, 2009. Cast in bronze, the statue depicts Father Damien in his later years after being diagnosed with the disease of those he attended. Much attention was given to the recreation of the disfiguring scars on the priest's face and his arm hanging from a sling. Kalaupapa is a small unincorporated community on the island of Molokaʻi, within Kalawao County in the U.S. state of Hawaii. In 1866, during the reign of Kamehameha V, the Hawaii legislature passed a law that resulted in the designation of Molokaʻi as the site for a leper colony, where patients who were seriously affected by Hansen's disease could be quarantined, to prevent them from infecting others. At the time, the disease was little understood: it was believed to be highly contagious and incurable. The communities where people with leprosy lived were under the administration of the Board of Health, which appointed superintendents on the island. Kalaupapa National Historical Park is a United States National Historical Park located in Kalaupapa, Hawaiʻi, on the island of Molokaʻi. Coterminous with the boundaries of Kalawao County and primarily on Kalaupapa peninsula, it was established by Congress in 1980 to expand upon the earlier National Historic Landmark site of the Kalaupapa Leper Settlement. It is administered by the National Park Service. Its goal is to preserve the cultural and physical settings of the two leper colonies on the island of Molokaʻi, which operated from 1866 to 1969 and had a total of 8500 residents over the decades. The Damien The Leper Society, formerly the Blessed Damien Society, is a non-profit organization aiding victims of leprosy in Vietnam and the Philippines. It is registered in Florida, United States. Jonatana Napela or Jonathan Hawaii Napela was one of the earliest Hawaiian converts to The Church of Jesus Christ of Latter-day Saints in Hawaii, joining in the 1830s. He helped translate the Book of Mormon into the Hawaiian language, as "Ka Buke a Moramona," working with missionary George Q. Cannon. Napela was appointed to serve as a superintendent of the colony at Kalaupapa, Molokaʻi, which he did for several years. He had accompanied his wife there after her diagnosis with leprosy. While at the settlement, he led LDS Church members and collaborated with Roman Catholic priest-missionary Father Damien to serve all the people of the settlement. Most were Protestant. Edward Clifford was an English artist and author. Kalawao is a location on the eastern side of the Kalaupapa Peninsula of the island of Molokai, in Hawaii, which was the site of Hawaii's leper colony between 1866 and the early 20th century. Thousands of people in total came to the island to live in quarantine. It was one of two such settlements on Molokai, the other being Kalaupapa. 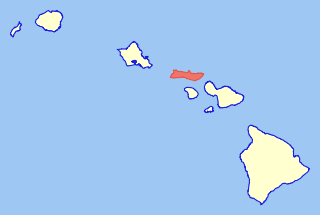 Administratively Kalawao is part of Kalawao County. John M. Systermans was born Jean-Marie Systermans, but was better known as Father Henry Systermans or Pater Henri Systermans. He was a 20th-century Belgian-born missionary and priest with the Congregation of the Sacred Hearts of Jesus and Mary. He served for most of his life in Hawaii most notably during the 1950s at the leper colony at Kalaupapa on Molokai. His service there followed in the tradition of fellow Belgian priest, Saint Damien, and his contributions were part of the research gathered by Gavan Daws for the definitive biography Holy Man: Father Damien of Molokai. Molokai: The Story of Father Damien is a 1999 biographical film of Father Damien, a Belgian priest working at the Kalaupapa Leprosy Settlement on the Hawaiian island of Molokai. Joseph Dutton, was a Civil War veteran and Union Army lieutenant, who converted to Catholicism and later worked as a missionary with Father Damien. William Keolaloa Kahānui Sumner, Jr. was a high chief of the Kingdom of Hawaii through his mother's family; his father was an English captain from Northampton. Sumner married a Tahitian princess. Aided by royal family connections, he became a major landowner and politician in Hawaii. William Phileppus Ragsdale was a lawyer, newspaper editor, and translator of the Kingdom of Hawaii and popular figure known famously for being luna or superintendent of the leper colony of Kalaupapa. Elements of his life story influenced Mark Twain's 1889 novel A Connecticut Yankee in King Arthur's Court. George Naʻea, was a high chief of the Kingdom of Hawaii, and father of Queen Emma of Hawaii. He became one of the first Native Hawaiians to contract leprosy and the disease became known as maʻi aliʻi in the Hawaiian language because of this association. Ambrose Kanoeali‘i or Ambrose Kanewali‘i Hutchison was a long-time Native Hawaiian resident of the leper settlement of Kalaupapa on the island of Molokaʻi who resided there for fifty-three years from 1879 to his death in 1932. During his residence, he assumed a prominent leadership role in the patient community and served as luna or resident superintendent of Kalaupapa from 1884 to 1897. ↑ Downes, Patrick (26 April 2013). 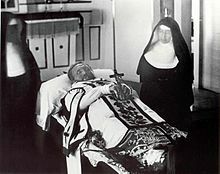 "St. Damien's feast day not the customary date of death". Hawaii Catholic Herald. Honolulu, HI. Retrieved 4 September 2013. 1 2 "Father Damien". Capitol Campus/Art. The Architect of the Capitol. Retrieved 2010-07-21. ↑ De Broeck, William (1913). "Congregation of the Sacred Hearts of Jesus and Mary and of the Perpetual Adoration of the Blessed Sacrament of the Altar". In Herbermann, Charles. Catholic Encyclopedia . New York: Robert Appleton Company. Retrieved 21 February 2009. 1 2 3 4 Tayman, John (2007). The Colony: The Harrowing True Story of the Exiles of Molokai. New York: Simon and Schuster. ISBN 978-0-7432-3301-9. ↑ "Blessed Damien de Veuster, ss.cc". Congregation of the Sacred Hearts of Jesus and Mary. Archived from the original on 17 July 2012. Retrieved 2012-08-02. 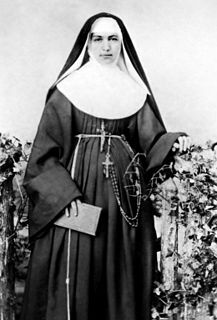 ↑ See: List of American saints and beatified people#List of American saints. 1 2 "'Apostle of the Lepers,' Spanish mystic among 10 to be canonized". Catholic News Agency. www.catholicnewsagency.com. Retrieved 2010-07-21. 1 2 "Pope Proclaims Five New Saints". Radio Vaticana. Archived from the original on 25 May 2012. Retrieved 2010-07-21. ↑ Boeynaems, Libert H. (1913). "Father Damien (Joseph De Veuster)". In Herbermann, Charles. Catholic Encyclopedia . New York: Robert Appleton Company. Retrieved 2009-02-21. 1 2 "Saint Damien – Servant of God, Servant of Humanity". Cathedral of Our Lady of Peace. Cathedral of Our Lady of Peace. Archived from the original on 11 March 2005. Retrieved 2010-07-21. ↑ Catholic Online. "St. Damien of Molokai". catholic.org. Retrieved 2017-02-02. 1 2 "Pater Damiaan "de Grootste Belg aller tijden"" (in Dutch). NOS. 2 December 2005. Archived from the original on 16 April 2014. Retrieved 2012-08-02. ↑ "Blessed Damian De Veuster". Biography. Congregation of the Sacred Hearts of Jesus and Mary. 2007-05-10. Retrieved 2009-02-21. ↑ Eynikel, Hilde (1997). Damiaan: De Definitieve Biografie. Leuven: Davidsfond. p. 82. ISBN 978-90-6152-586-8. ↑ Dutton, Joseph (1913). "Molokai" . In Herbermann, Charles. Catholic Encyclopedia . New York: Robert Appleton Company. ↑ "House Resolution 210". Hawaii State Legislature. Archived from the original on 2016-01-02. Retrieved 2012-08-02. ↑ "St. Damien Day Hawaii October 11". Hawaii Free Press. Retrieved 2012-08-02. ↑ "The lepers of Molokai" (PDF). The New York Times. 26 May 1889. p. 13. Retrieved 2010-07-21. ↑ Daws, Gavan (1984). 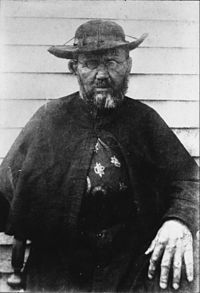 Holy Man: Father Damien of Molokai. University of Hawaii Press. p. 162. ISBN 978-0-8248-0920-1. ↑ Edmond, Rod (2006). Leprosy and Empire: A Medical and Cultural History. Cambridge University Press. ISBN 978-0-521-86584-5. ↑ "St. Damien of Molokai: Servant of God – Servant of Humanity". St. Augustine by-the-sea Roman Catholic Church. St. Augustine-by-the-Sea. Archived from the original on 13 July 2010. Retrieved 2010-07-21. 1 2 Carr, Sherie (10 October 2009). "Hawaii's Father Damien: From priesthood to sainthood". Hawaii Magazine. Retrieved 2012-08-02. ↑ Damien the Leper. Patterson, New Jersey: The Franciscans of St. Anthony's Guild. 1974. ↑ "Damien The Leper". EWTN. Retrieved 2012-08-02. ↑ "The Life of Father Damien". The Star-Bulletin. Honolulu, Hawaii. 7 October 2009. 1 2 3 4 5 Stevenson, Robert Lewis (1922). Father Damien – An Open Letter to the Reverend Dr. Hyde of Honolulu. The Works of Robert Louis Stevenson, Volume 15. W. Heinemann in association with Chatto and Windus, Cassell and Longmans, Green. pp. 479–501. ↑ Moblo, "Blessed Damien of Molokai" (1997). Note: "Carelessness" was a reference to the association at the time of leprosy with syphilis as a sexually transmitted disease. 1 2 3 Bernardo, Rosemarie (4 July 2008). "Aiea woman excited for her saint in making". The Star-Bulletin. Retrieved 2009-10-11. ↑ Downes, Patrick (28 March 2003). "Tribunal to examine Blessed Damien miracle claim". Hawaii Catholic Herald. Honolulu, Hawaii: Diocese of Honolulu. Archived from the original on 24 July 2011. Retrieved 2010-07-21. ↑ "Vatican Votes To Elevate Father Damien To Sainthood". KITV Honolulu. www.kitv.com. Archived from the original on 2012-04-05. Retrieved 2010-07-21. ↑ Sweas, Megan. "Obama Says St. Damien Gave Voice to Voiceless, Dignity to the Sick." Catholic News Service. 14 October 2009. ↑ Donadio, Rachel (11 October 2009). "Benedict Canonizes 5 New Saints". The New York Times. Retrieved 2009-10-13. ↑ "Molokai, la isla maldita (Molokai, the cursed island, 1959)". Internet Movie Database. Retrieved 2010-07-21. ↑ "Father Damien: The Leper Priest (1980) (TV)". Internet Movie Database. Retrieved 2010-07-21. ↑ "Molokai: The Story of Father Damien (1999)". Internet Movie Database. Retrieved 2010-07-21. 1 2 Welch, Rosalynde (21 April 2010). 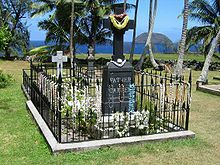 "The eighth circle of paradise: Father Damien of Molokai and Jonathan Napela in Kalaupapa". St. Louis Post-Dispatch, Religion blog. Retrieved 2013-02-25. ↑ Farrow, John (1937). Damien the Leper. Camden, N.J.: Sheed and Ward. OCLC 8018072. ↑ "'Damien the Leper' Purchased by RKO; Robert Sisk to Be the Producer — Joseph Calleia Has Been Assigned to Title Role". The New York Times . 17 May 1939. Retrieved 2015-11-27. ↑ "Hollywood Buys 45 More Stories to Add to 1940 Feature Programs". Motion Picture Herald . 136 (1): 34. 1 July 1939. Retrieved 2015-11-27. ↑ Snelson, Edward (1938). Father Damien – A Play. Longmans, Green and Co., London-New York-Toronto. ↑ "About Bill Neary". www.billneary.com. Retrieved 2016-06-01. ↑ These include: "Father Damien, Aid to Lepers, Now a Saint". Associated Press . 11 October 2009; De Volder, Jan and John L. Allen, Jr. (FRW). 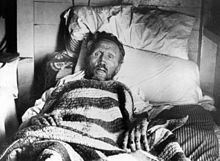 The Spirit of Father Damien: The Leper Priest. Ignatius Press, 2010. p. x; Haile, Beth. "Articulating a Comprehensive Moral Response to HIV/AIDS in the Spirit of St. Damian of Molokai". CatholicMoralTheology.com. 10 May 2011; "Brief Biography of St. Damien of Molokai" Archived 11 February 2012 at the Wayback Machine . St. Damien Catholic Church, Oklahoma City, OK; "The Canonization of Father Damien". FlandersHouse.org. ↑ Donadio, Rachel. "Benedict Canonizes 5 New Saints". The New York Times . 11 October 2009. ↑ These include: Damien Ministries – Washington, D.C. Archived 8 November 2011 at the Wayback Machine ; Damien Center – Central Indiana; Albany Damien Center – Albany, New York; Schenectady Damien Center – Schenectady New York Archived 11 January 2012 at the Wayback Machine . ↑ "Home". Saintdamienadvocates.org. 2012-06-08. Archived from the original on 7 April 2014. Retrieved 2014-04-15. ↑ "On Second Anniversary of the Affordable Care Act Passage, Hawaii Residents Join 140 Cities Across the Nation to Rally Against Its Impact on Religious Freedom". Hawaii Reporter. Retrieved 2014-04-15. ↑ "St. Damien School, CCSD" . Retrieved 2018-10-25. ↑ "St. Damien of Molokai Parish, Pontiac MI". www.facebook.com. Retrieved 2016-01-21. ↑ "Museum | St. Augustine By The Sea Parish". Staugustinebythesea.com. Retrieved 2014-04-15. Wikisource has the text of the 1913 Catholic Encyclopedia article Father Damien (Joseph de Veuster) .